New Piece of Old Lace In My Office, Come See! William Floyd Parkway, County Road 46, 1.5 miles north of Exit 68 of the Long Island Expressway. Visitors to the lab over the age of 16 must bring identification, see http://www.bnl.gov/visiting/ for detailed information. Textile research is a fascinating combination of art, anthropology, sociology, and the physical sciences. Existing collections in museums are increasingly benefiting from techniques familiar to the physicist, chemist, and biologist to characterize fragile items. Dr. Waters will discuss how such techniques are used the specific field of handmade lace. For example, carbon dating and genetics could help solve one of the biggest mysteries – the virtual disappearance of the superfine linen thread used in the 18th and early 19th centuries. 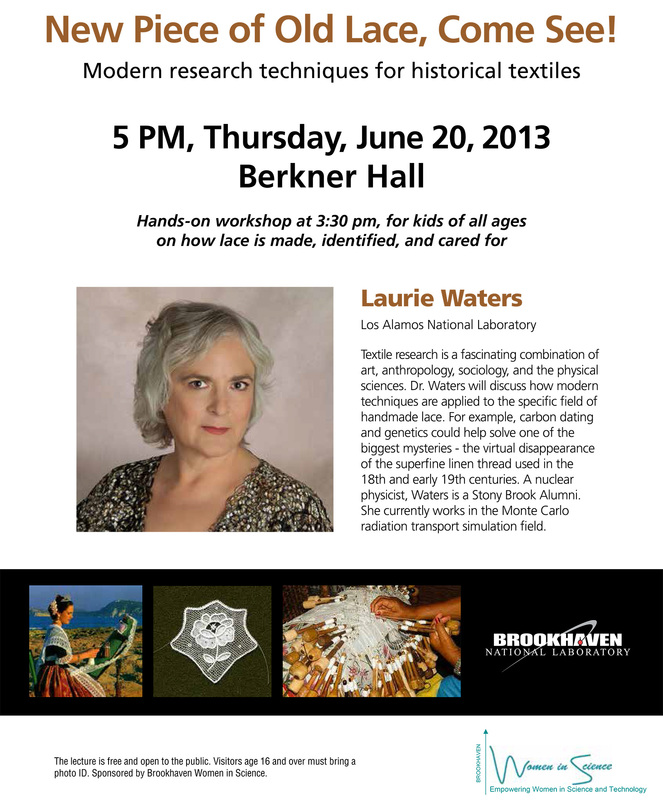 Laurie Waters did her thesis on Experiment E814 at Brookhaven, graduating from Stony Brook University with a PhD in physics in 1990. As a nuclear physicist at Los Alamos National Laboratory, her research focused on Monte Carlo radiation transport simulations for accelerator and threat reduction applications. She led the spallation target research efforts for the Accelerator Production of Tritium project and played a key role in the development of the Monte Carlo N-Particle eXtended code (MCNPX). She also has had a longtime interest in textiles as a collector, researcher, and maker of handmade lace. A hands-on workshop will also be held at 3:30 pm, for kids of all ages on how lace is made, identified, and cared for. Note: This event is open to the public, and one of the aims is to help interest young people in the sciences. This entry was posted in Original Research. Bookmark the permalink.